Obaku strives to create harmony in all aspects of life. We do our best to contribute to a more harmonious society. Every year Obaku participates in many different local and international sponsorships through various donations where we often experience a direct effect and impact. All of our employees enjoys a relaxing and inspiring work-environment, with healthy living and yoga on the daily agenda - supporting our core value of Zen philosophy. We have started our own Charity program called ‘Watches for Life’, because we are committed to helping our local and international communities. Since the program was launched in 2012, ‘Watches for Life’ has helped organizations and people in need across the world. The idea is a direct impact program, that focusses on discovering the immediate change. We cannot change the entire world, but we may be able to change the world for a few people – which means the world to us. Each year Obaku donates to various charities. Exemplified the ‘Watches for Life’ program has built a house for a family in the Philippines who have been homeless since Typhoon Yolanda devastated their house. Obaku has also created a fund, where young people from the same small village in the Philippines can apply for having their education funded. In addition, Obaku supports an orphanage in Thailand with the Baan Unrak project which has enabled the organization to put a new roof on their children’s home. We genuinely believe in making a difference. Jason and Vanessa are studying to become teachers thanks to Obaku's 'Watches for Life' prorgam. 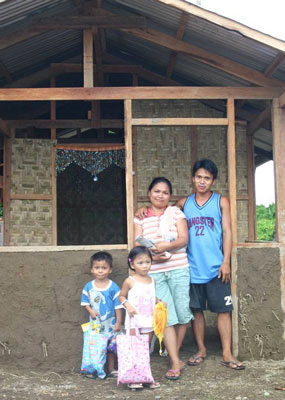 Ninoy and Nina have a new home thanks to Obaku's 'Watches for Life' program.